You are here: Home / z / What is Faith? Defining “faith” (Gk., pistis) and the verb “believe” (Gk., pisteuō) is a bit like trying to define love. We can look up the words in Greek and Hebrew dictionaries and compare how the words were used in various ancient contexts, but when it comes down to how the word is used in real life, the way the word is used today bears little resemblance to the way the word was used in biblical times. With love, we go through our days talking about how we love football, love pizza, love our cars, and love our spouse, and then we read in Scripture about how we are to love God and love one another, and although we know there is a difference between the various forms of love, we don’t really think about it too much or understand the ways that biblical “love” might be different than our modern use of the word. Is Faith the same thing as hope? In this case, the word “believe” does not even rise to the level of hope, but is nothing more than wishful thinking. Is Faith the same thing as trust? Sometimes when “faith” is used today, it means “trust.” Banks talk about the “full faith and credit” of the United States Government in insuring our deposits, meaning that we trust that if the bank loses our money, the government will give it to us. Or as another example, you may have heard the story about a man who crossed Niagara Falls while pushing a wheelbarrow, and then asked the watching crowd if they believed he could do this same feat with a person in the wheelbarrow. They all enthusiastically shouted “Yes!” but when he asked for volunteers, nobody came forward. This illustration is sometimes used to suggest that faith without follow-through is not really faith; but what it really proves is that there is a difference between faith and trust. In light of this, people get confused—and rightfully so—when they read about faith and belief in the Bible. They are not sure whether they should understand faith to be more like hope, wishful thinking, trust, or maybe something else. 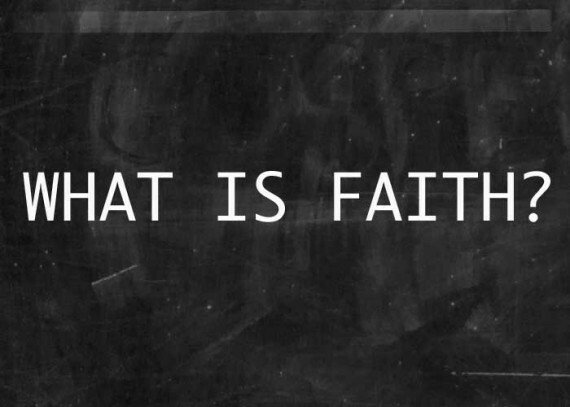 So when it comes to the biblical definition of faith, it is probably best to think about faith (and the verb “believe”) as a confidence, persuasion, or conviction that something is true. While it need not rise to the level of certainty—for we have all know that beliefs can change when we are presented with new evidence—faith is being fully persuaded by the evidence we now have. 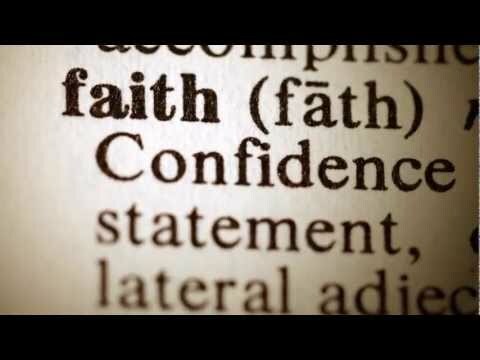 We will talk a bit more about what faith is and what faith isn’t in the days ahead, but for now, what do you think of defining faith as “confidence”? Faith is what you make of it. Well, I’m out of luck I suppose because I have a hard time with confidence and am rarely, if ever, certain about anything. Rachel, I probably overstated the definition a bit. I should probably revise as something like “confidence based on the information we now have.” Like you, I am not certain I am ever 100% certain about anything. I have changed my “beliefs” too often in life when new information was presented to me to be absolutely certain. Internal knowledge and confidence versus External knowledge and confidence. It’s a bit like the difference between scientific knowledge and historic knowledge. Or maybe math knowledge and art knowledge. Doubt is okay. We all doubt all the time about many things. I remember hearing this definition a long time ago. I was told to think of a chair. I could believe all I wanted that the chair could hold me up but it wasn’t faith until I actually stood on it. It was just optimism otherwise. It’s a good definition but it’s kind of hard for me to wrap my head around it when it comes to spiritual matters. With the wheelbarrow and chair example you can easily know you’ve had faith in them once you get in it or stand on it since there’s physical evidence. How can you know for sure you’ve had faith in Christ alone rather than just telling yourself that you do but failing to get in the wheelbarrow? Great questions about how to know for sure you have faith. I do not have a good answer. The post above is really more of what I currently believe about belief… mainly because I haven’t come across anything that seems to explain things better. But this doesn’t mean my belief about belief has no difficulties or problems. It does, and you have raised one of them…. I think I would say that you can know you believe something the same way you know you know something. If you can think of belief more like “knowledge” then it might help. Faith is something that God wins us to. Faith is not, “God said it, therefore, I must believe it.” God would never expect us to trust him any further than he had shown us that he is trustworthy. Faith is a process of ever increasing confidence that God is trustworthy that comes from past experience. Ever heard of the woman who married the charming man, who after the marriage turned out to be psychopath? Go to the women’s refuge and tell them about your theory. Not sure I understand your comment. If you’re saying, “could God not be fooling us”, I guess your right, but if that’s the case we’re all in trouble. I would say that the seat of faith is the heart and not the mind. I realize this is subjective, and we don’t like subjective. I see faith as a knowing deep in the heart, and this heart-knowing is what convinces the mind (not the other way around). I like how you say that faith is something God wins us to. I really like that. God is constantly revealing more of Himself to us, and wooing us, drawing us, etc. and as we come to believe what He reveals, we then are able to move on to the next area of faith He wants to win us to. Have you read or written much on this anywhere? Faith: Believing that what our spirit tells us is true. Our flesh, our rational minds may struggle with these things, but The Spirit witnesses to our spirit and we choose to believe what we’ve heard. The Witness is trustworthy. Of course we must be able to distinguish between the voice of the Witness and other voices who often are not trustworthy. Faith, whatever I want it to be when I want it to be. My flexible fiend. Faithfulness is an idea and accomplishment of faith is the mind. Yes, there is definitely an element of listening to our spirit and the Spirit. I often have trouble knowing the difference between my selfish desires and the Spirit, but think that we learn with practice to discern between the two. The question you have to ask yourself, is what were the apostles thinking when they used the word faith. This gospel message on most levels can be accepted to be passed to us with a high degree of accuracy. I kind of think faith, the way it is used in this day(examples Jeremy has given), doesn’t really cut it. But confidence in the evidence that exists seems to be a satisfactory way to put it. I kind of think the stars of the rest of the story were fairly confident that what they were passing along was accurate and true, not a blind leap. Yes. I just read today about how faith today became the wishy-washy hope-so feeling that most think of today. Maybe I will include this in a later post. It is definitely not a blind leap. I will check those out. Thanks! Faith is my “Thank You” to His finished work of the Cross, or put another way, my positive response to all Christ has provided for me by grace, or another way, – Trusting in all he has anticipated and provided for me. “The gospel is not an invitation to pick up tools, but to drop them. It’s not a job advertisement, it’s a day of rest. What’s important is the position of faith in our thinking, where it comes in the process of our thought. Faith before reason is tribalism. It’s driven by emotional loyalty. Faith selects and interprets facts and experiences. Reasons are formed to justify the faith. Highly common among the religious, nationalists, and politicos. Extremely dangerous — enables bigotry and dehumanization. Someone who believes that God orders genocides has this kind of tribal faith. Archetype: the young child who believes in Father Christmas. People who put facts and experiences first are less zealous and more openminded, as new facts and experiences can present themselves, or old facts can be re-contextualized and reinterpreted. But facts and experience never form a secure foundation for faith. One day the sun travels around the earth, the next the earth travels around the sun. Nothing is more misleading than an obvious fact. Faith based on the interpretation of facts is very open to persuasion and manipulation. It’s not so much faith but a holding position. Archetype: teenagers declaring their eternal love for each other. Rigorous reason, that explains facts leads to firm faith. This is really the only sure order. By rigorous I mean the Sherlock Holmes standard: “When everything else has been eliminated, what remains, however unlikely, must be true.” This level of reasoning requires hard work but the faith that results is firm. Archetype: It’s elementary my dear Watson. So which is the right location? I am not fond of any of the three. Maybe faith is a mixture of reason, experience, and revelation? I recommend Greg Boyd’s recent book Benefit of the Doubt to help with this. It challenges the idol of certainty and proposes we regard faith primarily in relational terms – as trust in a person. This means we do not have to be certain but simply ‘confident enough’ to follow that person (e.g. Jesus) in trust, and let that trust grow through deepening relationship which includes wrestling with our doubts. Oh , yeah! I have that book and have been meaning to read it. Thanks for the reminder. Based on many of the comments above, I was just thinking, “maybe FAITH isn’t the most important thing, but the object of faith, namely, Jesus.” This makes faith more relational and less an exercise of the mind. Anyway, I will read that book…. Faith without works is dead ! When you really belive it, you do it ! When ic comes to God’s word, when you believe it, you do it ! Have you ever thought that faith without works can also express true faith?That refraining from forcing our will, our solution, our expectations onto others can be an act of faith too. I have a new mantra to offer: faith without peacefulness is dead. Faith still exists, even when it has no works, it’s just useless faith. That is what James is saying in James 2:14-26. Just as the body without the spirit is dead, so faith without works is dead. Does a dead body exist? Of course. But it doesn’t do anything. So logically, does a dead faith exist? Of course. But it doesn’t do anything. That pistis (faith) means trust, confidence in, or assurance, can be checked in any Greek lexicon .Friberg’s Analytical Greek Lexicon has “confidence, faith, trust, reliance on.” Vine’s lexicon says, “firm persuasion,” and Bullinger’s lexicon says the same thing. Thayer’s lexicon says, “conviction of the truth of anything. Very good. But when the repair man says, take your son to the mountain and sacrifice him to me, wouldn’t you say it’s time to stop trusting? Part of the point for God telling us the story of Abraham and Isaac was so that Jesus Christ could study this event in preparation for his coming sacrifice. After all, the OT was the training manual for Jesus Christ. Why was Abraham so willing to sacrifice Isaac? God had told Abraham that through Isaac would come Jesus Christ, yet he was going to sacrifice Isaac and end the blood line? Because Abraham must have believed that God would raise Isaac from the dead. See Heb 11:19 below. When Jesus Christ was on the cross he believed that God would raise him from the dead just as Abraham believed for God to raise Isaac. Jesus Christ used the Old Testament as a training manual for his life and he was able to look back at the incident with Isaac to help prepare him for the moment. Good answer Emilio, I’m gonna have to play rough. Didn’t Joneses followers have the same kind of faith as Abraham? They trusted that repairman alright? What’s the difference? Jim Jones is an extreme example of a false prophet teaching the wrongly divided word of God to people who in many cases did not bother checking the bible to see if what he said fit or not with the rest of the bible. Jones followers did not have the same kind of faith as Abraham—They trusted Jim Jones not God. You said faith is based on relationship. You said, when a repairman ” does the work when he says he will, does a good job, charges what he said he would, and seems to be honest and fair, our faith (trust) in him grows. Biblical faith is the same.” I’m asking if faith based on relationship is a valid test of truth. Joneses followers had a relationship with him and obviously trusted him with their lives, but that doesn’t make their trust valid. There’s something missing, Abraham was willing to sacrifice his son for God, Jesus to sacrifice his life too, Joneses followers their lives. Why are two of those acts of faith that you approve of and the last one not? they are all based on relationship. There are similar tools for evaluating individuals, especially those who might be placed in a position of authority. However, for unobvious reasons, those tools are not usually available to non-psychologists. Consequently, the primary way for non-psychologists to evaluate individuals, is to see how congruent their actions are, to their stated beliefs,and practices. For those who prefer a more bblically based approach, apply _Philemon_ to the congregation, _Titus_ to the preacher, and _1 Timothy_ to the leadership. Hello Emilio – I by and large agree with your points that the Abraham/Issac episode was a “Type” (although #4 might be a stretch); a foreshadowing of the coming of Jesus. There are several of those in the OT. If you are meaning it in a figurative way, I might just be obtuse and missing the point. Which isn’t unheard of, just ask my wife. But if you are suggesting a more literal meaning, I’d like to hear your thoughts on how you believe that he was in need of a How To Guide during his Ministry. Just curious. thanks! I’m not sure this will post, as this blog is several years old, but I love your analogy! But- just one question- If this was a lesson for Jesus and what was to come from it, then why wasn’t Isaac truly sacrificed, and then raised to life 3 days later?? Jesus was not spared as Isaac was. ?? I may need to reconsider my rejection of the word “trust” as a synonym for faith. So it seems there is a difference of distinction between the two? Yes, trust is based on relationship. The love and trust I have for my wife grew as I got to know her. How can you trust someone unless you know them? I believe the bible is God’s primary method of communication to man and through the bible we get to know God and eventually trust Him. Does every relationship we forge on this planet earth result in trust? No. So then, no, a faith based relationship is not always a valid test of truth. No , I do mean it in a literal way that Jesus used the OT as a training manual for his life. 1. Jesus declares that he is not the author of his own doctrine. “My doctrine is not mine, but his that sent me” (John 7:16 and 17). If it wasn’t his own doctrine he had to learn it and part of that learning came from reading the OT. 2, Jesus represents himself as having been instructed by the Father. “As my Father hath taught me, I speak these things” (John 8:28). Part of that learning came from reading the OT. 3. He refers invariable to the Father as the origin of the authority by which he spoke and acted. “The Father hath given to the Son authority” (John 5:26 and 27). 6. Did Jesus as a child not grow in wisdom. He did not just have all the wisdom he needed from birth. He grew in it, he learned. Luke 2:52. Okay Emilio, I don’t think you understood my question, but I can see that you have a very strong faith in what you are saying, and I respect that. Troubleunderfoot, I dont think you understood my answer and I can also see you dont really care anyway , so we’ll leave it at that. Wow, I respond by telling you I respect your faith even though your answers don’t address my points. You respond with a little self-rightoeus tantrum. That really proved your point. Troubleunderfoot-Forgive me if I confused your responce with being condescending and sarcastic. We obviously have two very different points of view. Troubleunderfoot’s point is that trust doesn’t make something true. Emilio’s point is that trust is based on relationship. Emilio, your reply doesn’t answer Troubleunderfoot’s question. Why get angry with him when he tells you that? You have question the order, but that’s how Christians are. Believe the Bible then God. But he can’t substitute bible for JJ, to register my point. That has to be ignored. So Joneses followers believed that Jones represented God, just as Emilio believes the bible represents God but there’s no similarity because …. So he talks about Jesus learning from the Old Testament and his marriage, because they’re good ways of avoiding my point. I don’t mind, this is to be expected when talking with religious folk.I think if Emilio faced up to the question he might find out something that will lead him closer to God, but he prefers to avoid the question. His faith is really no different to a Jim Jones follower, or a muslim, or a Jew, just the object of the faith is different. He knows it, wants to ignore it., and so vomits on me for raising the question. Okay, I can live with that. There’s no way through the maze in Emilio’s mind. That’s up to Emilio. He’s losing out from getting closer to God, but he can’t see it that way. C’est la vie.